After coming up short of a sectional championship in 2015, the Moorestown High School boys’ lacrosse team got back on top of the South Jersey Group III mountain in 2016. The Quakers had a successful season, finishing the year 18–4 and defeating Clearview Regional High School, 12–9, on May 28 to win the South Jersey Group III championship. It is Moorestown’s second sectional title in three years. Head coach Baron Wallenhurst said the 2016 Quakers were motivated to get back to the sectional championship after falling short against Shawnee High School, 8–7, in the 2015 South Jersey Group III title game. This year, the Quakers relied on a number of players who played smaller roles in previous seasons. One of the biggest success stories from Moorestown’s 2016 team was senior Bryan Wright. Wright’s high school career had been plagued by injuries. 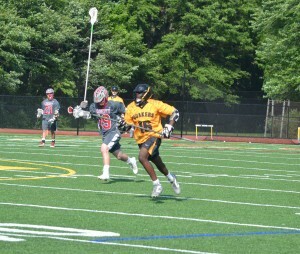 After missing all of his sophomore season and a decent chunk of 2015, Wright emerged as a force for Moorestown, leading the Quakers with 64 goals. The Quakers also got plenty of offense from junior Frankie Labetti, who scored 54 goals for Moorestown. Labetti had a number of games where he registered five or more points, including an April game against Cherokee High School where he tallied seven goals and added three assists. “There were times where he just dominated games,” Wallenhurst said of Labetti. Wallenhurst described this year’s team as a solid combination of upperclassmen and younger players. He said seniors such as David Shore and Ross Lazarus stepped up to larger roles this year, while the play of younger players such as sophomore Judah Hicks helped set up a foundation for future seasons. Moorestown was playoff-ready well before the postseason started. Playing in the Skyline Conference against many of North Jersey’s top teams such as Bridgewater-Raritan High School and Hunterdon Central High School, Moorestown finished 2016 with the 23rd toughest schedule in the state, according to laxpower.com. After winning the sectional, Moorestown fell just short of a state championship on June 1 when it played North Jersey Group III champion West Morris Central High School. Moorestown led the game, 5–2, at halftime, but West Morris stormed back to tie the game in the fourth quarter. With four seconds left, West Morris’ Ryan Antonelle scored the game-winning goal, ending Moorestown’s season. The last-second loss deprived Moorestown of its first state championship since 2011, but Wallenhurst said it doesn’t diminish the season the Quakers had.